Most EVs will recommend a standard 220/240V NEMA 14-50 outlet, the type of outlet most houses use for washing machines. A 30-amp circult is sufficient for most cars, with the circuit breaker rated for at least 40 amps. You want to reduce the 40 amps by about 25% to account for safety due to heat. Typically a 30-amp service will roughly give you the ability to add 30 miles of range in an hour to your car. You should contact your electric utility and understand how much power your home is getting. There are significant costs in the Thousands to have electric utility run a higher AMP circuit to your home. Make your installation futue proof. Plan for future cars and higher power needs. We planned for the additional of a Tesla Powerwall battery pack. Some owners need a connection to electric utility for controlling energy use during peak times, helping for the Smart Grid. It is pretty obvious that the charger needs to be in your garage. Existing breaker boxes, solar electric equipment, etc also determine when a charger might go. Examine the car you are buying an situate the charger for its charging port location. The Tesla Model S’s port is at the left rear of the car, while a Nissan Leaf has its located at the front hood. Cables usually run from approximately 15 to 25 feet. Will the cord need to charge a car in the driveway? Some EVSE are Wi-Fi enabled to alert you to charging status. Make sure the box is within your Wi-Fi network’s range. Do you need to charge two cars someday? 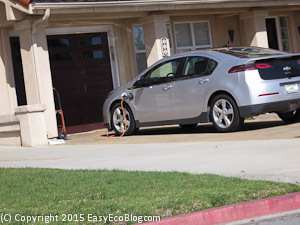 Do you want to be able to take the EVSE when you move? If so work with our electrician on wiring and positioning breaker boxes and circuits. Local building codes also come into play when installing your charger. There are several kinds of electric car chargers. EVs need an EVSE (Electric Vehicle Supply Equipment) or wall mounted box to connect the car to your home’s electric outlet for charging. This module also known as a “Charging Stations”, “Charging Cords”. Most EV’s include a compact portable charging cord from the manufacturer, designed for emergency or trickle charging. This is called “Level 1” standard outlet or NEMA5-15 at 110/120V. Level 2 use 240V 30amps of power for faster charging or future proofing. The goal is definitely to get this type of EVSE if it is not much more expensive. Some folks can get away with standard level 1 charging. 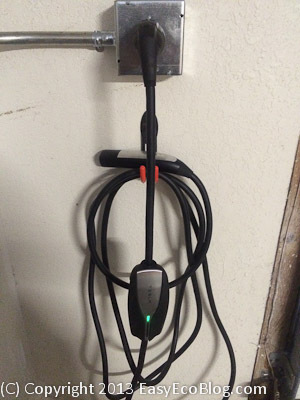 The Tesla Model S comes with a charging cord that supports NEMA-14-50 or 220/240V. There is no need to buy an additional EVSE box to charge the Tesla. With my Tesla and a 40Amp circuit, I am able to set the car to 33Amp and achieve 24 miles/hour charge rate. A 20% margin was giving for heat reasons. A Tesla Model S 70D with 70-kWh battery fully charges in 12 hours with this type of car charger. 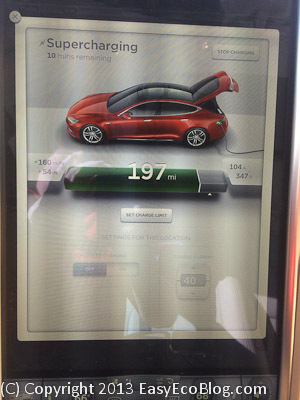 You will get a super fast sub 2 hours from zero charge when you use a Tesla Supercharger. You need to install a charging dock to perform faster charging. Nissan recommends home chargers through AeroVironment that start at $999 or $1999 with installation. 3rd party EVSE are cheaper. The popular Clipper Creek HCS-40 costs about $650. With a 240 volt circuit, the Leaf goes from empty to full in under 5 hours. The Chevrolet Volt comes standard with a 110V portable charge cord. This will meet many Volt customers’ charging needs (approximately 10 hours to charge to Full). If you want faster charging times (approximately 4 hours) an optional 240V charging station is available through Bosch and other companies, Chevrolet’s preferred provider of charging solutions. A standard SAE J1772-2009 connector in used. 16.5-kWh, T-shaped lithium-ion battery charges quickly. 2016 Chevy Volt has a 3.6 KW onboard charger, upgraded from the 3.3 kW. The BMW i3 EV uses the standard Combo SAE J1772 connector and has an onboard charging system that nominally can handle 7.7 kilowatts. The SAE combo cord also makes the i3 accessible to 50-kilowatt DC Quick charge stations that are capable of refilling the car’s battery pack to 80 percent full in around 20 to 30 minutes. The Fiat 500e is a cute small EV that seat 4. Fiat is losing $14,000 on every 500e sold, so consider it a bargain! EPA range is 87 miles. The 500e has a 24 kilowatt-hour liquid-cooled lithium-ion battery pack with a 6.6kW charging rate. 4 hour charging using a 240 Volt plug putting out 30 Amps. No Quick Charge capability. It produces 83 kilowatts or 111 horsepower, about the same as a Nissan Leaf. Official city mileage is 122 MPGe, and 108 MPGe on the highway. The Mercedes B Class EV is a small SUV that uses a Tesla battery back and drive system. It has a similar to other EVs EPA 87 mile range. 177 horsepower or 132 kW. The battery holds 28 kWh and uses a 10kW charging rate. 40-amp 240-volt EVSE is needed to use the B Class’s full charging rate. Note that there are not a lot of these. No quick charge port. There is an option for range plus giving it up to 31.5 kilowatt-hours. The VW eGolf is an electric version of the Golf. It is a 4 door hatchback with 24kWh battery, 83 miles of EPA range, and 7.2kW charge rate. 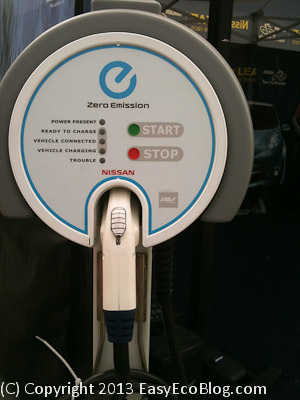 240-volt home chargers supplied with 30-amp service are needed for this EV. eGolf supports Quick Charging using Combined Charging System. Any competent electrician should be able to install EVSE equipment. Some experienced EV installation specialists charge more. Most car manufacturer’s will recommend local certified installers. Some EVSE installation jobs can cost as little as $300, if the EVSE is mounted next to the breaker box. The Installation can cost as much as several thousand dollars if a conduit needs to be run from another part of the house, or if new or upgraded electrical service is required at your home. You could also DIY the installation, if you are competent enough. There are many options for prospective EV car owners. Do your homework and understand how much power you need, where it can be located, and what your new vehicle requires.